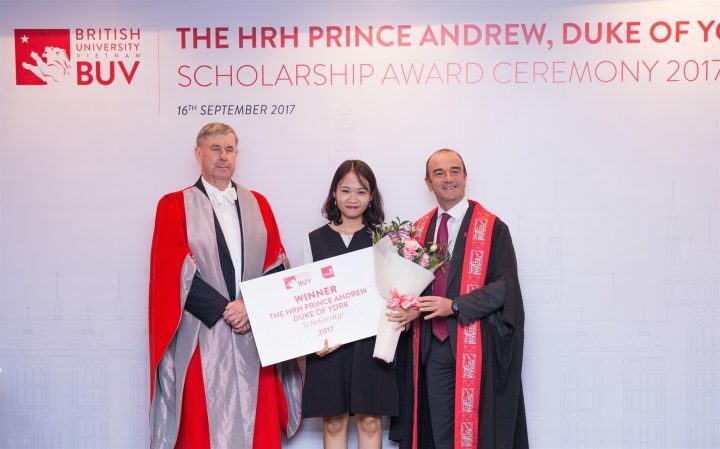 (*) Please note that HRH Prince Andrew scholarship is not applicable to current British University Vietnam students. We begin with a road show programme at high schools in Hanoi, to introduce the HRH Prince Andrew Scholarship. Candidates need to submit their full application with academic transcript of Year 12 and other supporting documents to complete the scholarship application package. 2 passport sized photos (must be 2 copies of the same photo taken within the last 6 months). Originals in Vietnamese are NOT required to be translated into English. Applicants are required to submit one set of supporting documents with their application. A Scholarship Panel is established annually to approve a short-list of candidates. 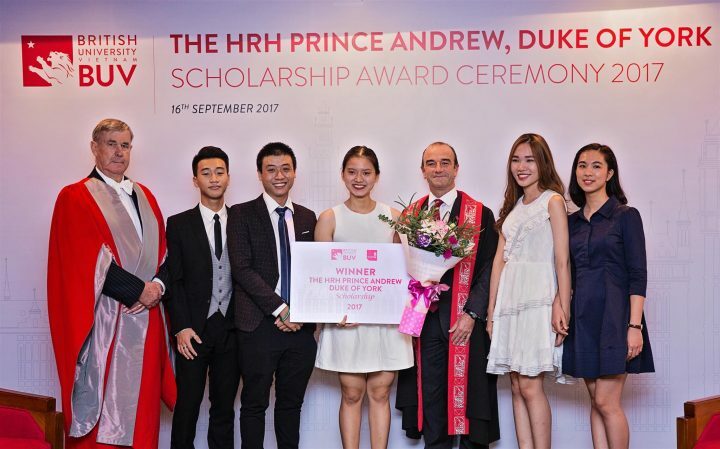 HRH The Prince Andrew, Duke of York, Scholarship programme is a full scholarship valued at more than 700,000,000 VND and covers the tuition fees for Pathway programmes and an undergraduate courses at the British University Vietnam in addition to the travelling cost for attending the scholarship interview round for students who are not in Hanoi (if needed). BUV Bachelor programmes are taught in Vietnam but awarded by UK reputed public universities. A key feature of the programme is to contribute to Vietnam’s development through providing the world class higher education opportunities offered at the first British owned university in Vietnam. The awardees are selected based on a combination of previous academic performance, relevant experience of community work and the potential to become leaders in the public sector, business and academia. 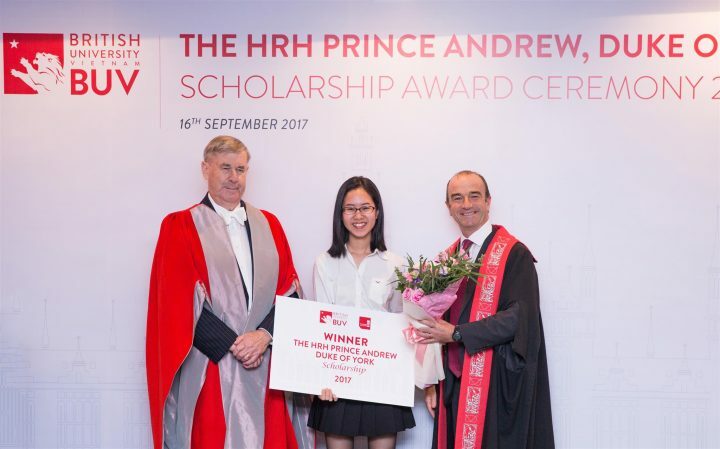 The scholarship programme is named after a member of British royal family – Prince Andrew, Duke of York, UK, including 04 full scholarships every year. 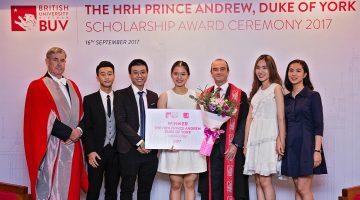 Until now there have been 26 Vietnamese students proudly being awarded this scholarship. They are the pride of their family and school. (f) Not hold any other scholarships. Where and when to submit your applications Application submission deadline: 25/05/2019. Graduating from Quoc Hoc Hue High School for the Gifted, as an English specialised high school student, Phuong was exposed to foreign information and had developed an international mindset for a long time. She knew that she wanted to pursue her higher education in an international environment. That's what led her to BUV. Being the co-founder of a project bringing English lessons to orphans in orphanages all around Hue city called L.I.F.E (Lasting Inspiration For Education) and taking part in several social activities throughout high school gave Phuong the confidence to walk into life and reach for opportunities. This and her 8.0 IELTS score helped Phuong to get an internship slot at Vietnam Business Forum right from the first semester of her freshman year. 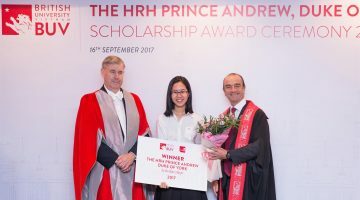 Duyen Ngan graduated from Singapore International School with highest score in Cambridge University's AS level Mathematics. Ngan has been nurtured in a British education environment since Highschool and she realised British education offered her the opportunities to grow, to be mature, and to achieve her ambitions. With passion and hard work, Ngan was awarded with the Academic Awards and Merit Awards every year from year 9 to year 12, for her outstanding GPA. Most notably, in year 11, she scored an excellent 123/125 points in overall for Algebra and Arithmetic, with tests modeled by Cambridge University, and surpassed thousands of candidates to achieve the highest scores . Ngan does not just have an outstanding academic results, she also proactive and energetic in other fields. With passion of contributing to the development of community, Ngan joins ‘Volunteer for Education’ organisation to bring a better education environment for disadvantaged children in rural areas in Vietnam. Duyên Ngân shared “I'm having a great time at BUV, with activities such as going on field trips to global firms, where I learnt a lot. The events and students clubs, especially the dance club, are also the very special aspect at BUV because students themselves are the creators and contributors, and they create great moments for eveyone." Ngoc graduated from Tran Phu Gifted High School with a GPA of 9.2, achieved an IELTS 8.0 and won the 3rd National Prize for English. Following the desire to help others develop, during high school years, Ngoc got engaged in several educational works and social activities, especially those concerning career and culture education for children. She also has a passion for writing short stories and poems. One of her short stories was chosen to be featured in writing community Launchora’s Summer e-collection 2017. Ngoc quickly got engaged in the international environment and truly fall in love with BUV since she has got the chance to meet many talented seniors and enthusiastic lecturers who are inspiring and encouraging Ngoc to get out of her comfort zone. Earlier this semester, Mai Ngoc got elected as the President of BUV Business Empowerment Club. Though this is totally a new challenge and experience for Ngoc, she is excited to explore more adventures at BUV. Tham’s background was a student major in Literature at Chu Van An High School. During high school years, she was able to keep her academic record outstanding with the GPAs were always ranging from 9.0 to 9.1. Not only excel in academic, Tham was also proactive in extra-curricular activities, both inside and outside the school. She was the Leader of the Broadcasting Board and a member of the C-Team – organising department of Chu Van An Youth Union. 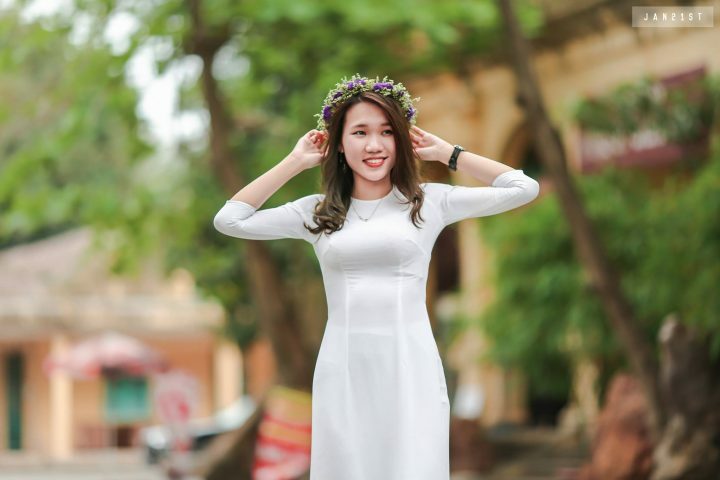 Tham also impresses people with her independence as from early days as a student, she has worked for some jobs such as teaching assistant for English class and design intern for a Vietnamese teaching corporation. Currently, she is working for USGuide organisation, which previously conducted several events such as You Can Do It and Mentoring Program. Tham used to be a student in top university in Hanoi, however, since she didn't find herself attuned with the traditional style of learning, she convinced her family to attend an international environment like BUV. 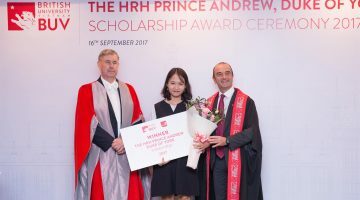 With great effort, she succeeded in achieving this valuable scholarship and attend this dynamic university, where she believes she can develop herself for further education and later career as a businesswoman.